We're delighted to announce that Flight Centre UK has won four awards in the British Travel Awards 2016! In a room full of fellow travel industry professionals, Flight Centre staff were celebrating at last night's Rio-inspired awards dinner held in Battersea Evolution, which saw them triumph in four different categories. 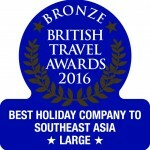 Most notably, Flight Centre secured the accolade of 'Best Regional Travel Agency'. Flight Centre UK's Retail Managing Director, Alison Zacher (pictured above, right), was overjoyed when she learnt of the announcement at the prestigious ceremony. She said: “This is an outstanding achievement for Flight Centre, and we are absolutely delighted. It is a great honour to have been recognised at such a high level by fellow British travellers and the wider travel industry. As the largest consumer voted awards programme in the UK, the British Travel Awards is considered the benchmark for excellence within the travel industry. This achievement showcases Flight Centre UK's commitment to securing great-value holidays, as well as acknowledging the excellent service provided by our knowledgeable and friendly Travel Experts. Bring on the 2017 awards! 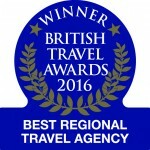 Book an appointment with one of our Travel Experts to find out what makes our service so award winning! We'd love to meet you face-to-face and plan your perfect tailor-made holiday.